Always organic. Nothing unnecessary. Setting standards. No junk promise. Suitable from 18 months +. Gluten free. No added salt or sugar - contains naturally occurring sugars. Suitable for vegetarians. 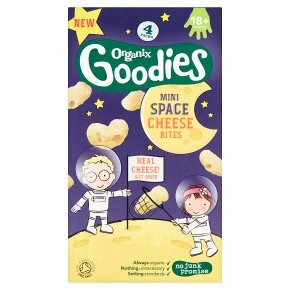 For little explorers on the go... our mini space cheese bites are out of this world! Organix mini space cheese bites are out of this world! Our space cheese is real that has simply been dried. We have sprinkled some potato starch on it to make sure the pieces don't stick to each other and that's it. SAFETY ADVICE: For little ones 18 months +, due to the natural size and shape variation of this food, please ensure they are sitting down and supervised.<br>IMPORTANT INFORMATION: The natural ingredients may vary in colour and cause staining.